Scooper - Technology News: Where do people think they work harder than they actually do? Where do people think they work harder than they actually do? Ever feel like you’ve gone above and beyond what your job required? You’re not alone, especially if you’re an American. 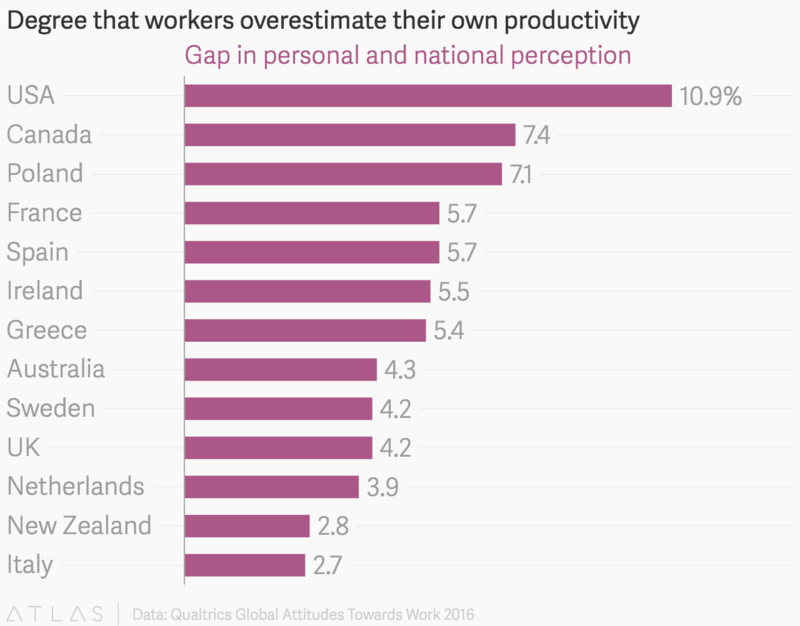 Nearly 11% of US workers overestimate how productive they are relative to their compatriots, according to a survey of more than 6,000 respondents in 14 countries by Qualtrics, a market research platform. Compared to Americans, Italians and New Zealanders only slightly over-stated their productivity at work compared to their fellow citizens. The measure was derived by first asking respondents what proportion of their individual work days were productive, and then asking them to estimate the same proportion of productivity for their countrymen. The gap between the two is shown in the chart below.